In recent weeks a number of conflicting news items related to Ukraine have appeared in various sources which combine to demonstrate the scope of “Byzantine symphonia” in its 21st-century Russian reincarnation. As I noted previously on these pages, the expression denotes a religio-political ideology from Orthodox Byzantium according to which church and state were said to speak with a single voice. This produced mixed outcomes in the Byzantine Empire, and later in Tsarist Russia, resulting in some of the most shameful pages in the history of the Orthodox Church. In Russia’s case we have only to recall the brutal persecution of its Old Believers from the middle of the 17th century over how to make the sign of the cross and which prayer books to use. This is the second article in our Lenten Meditations 2019 series. Before the foundation of the world, God knew we would turn our backs on Him, grasp the fruit of knowledge and power, and crucify His Son. And yet God created us. Our very creation is forgiveness. Since the beginning, God has continued to forgive us. At the moment when we stood accursed before him, frightened, ashamed, and about to be driven from Paradise, God sewed skins to clothe us in our need, as a mother comforts her children—having already promised us salvation. When Vladimir Putin rose to the presidency of Russia in 2000, he inherited the remains of a once-fearsome communist-atheist imperial state. In the intervening 19 years, he has transformed Russia back into an imperial power with global ambitions. One of his key tools in that transformation has been the Russian Orthodox Church. 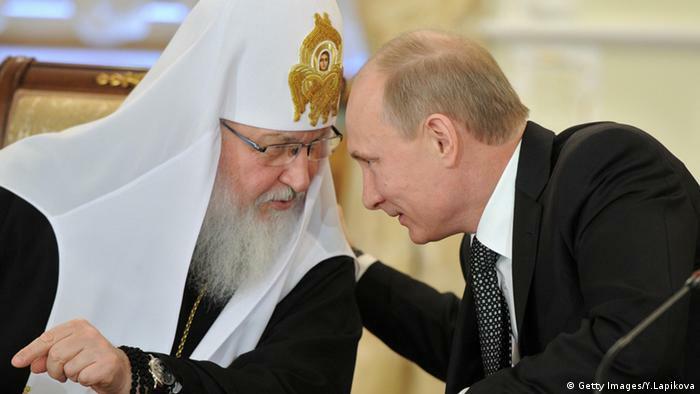 Putin often invokes the Russian Orthodox Church in his public speeches, giving the church a much more prominent place in Russian political life than under his predecessors. But these invocations hardly seem sincere in the religious sense. Rather, he has used the church to justify Russian expansion and to try to discredit the West’s influence in Eastern Europe. Teens under Attack by the Depravity in Our Culture & the Insanity of this Age! What Can Orthodox Christians Learn from Islamic Studies? Our decision to publish the present article does not imply our endorsement of the church referenced therein or its episcopate. Orthodoxy in Dialogue reiterates its commitment to the canonical Orthodox Church as currently represented in the diptychs of the Patriarchate of Constantinople. The author and her conference co-presenter are known to our readers through On Being Orthodox & Genderqueer: An Interview with “Lindsey”. I first learned about the Queer & Transgender Studies in Religion Conference at UC Riverside thanks to Orthodoxy in Dialogue. I’m so glad I attended. I co-presented some preliminary research with Lindsey about Mother Maeve Leroux, a transgendered nun, bishop, and founder of the Universalist Orthodox Church.